It was the legendary Sly Stallone who once drawled that “it ain’t about how hard you hit; it’s about how hard you can get hit, and keep moving forward.” And honestly, that pretty much sums up my experiences with not only From Software’s titles, but any title that apes the genre they created. See, I persevere, I eventually come close to “gitting gud”, but I’m not the sort of person who can speedrun a game like Dark Souls, or play it with bloody Rock Band drums or whatever. I have to learn a game’s intricacies, and then spend upwards of four hours hating myself and the world before it all begins to click. 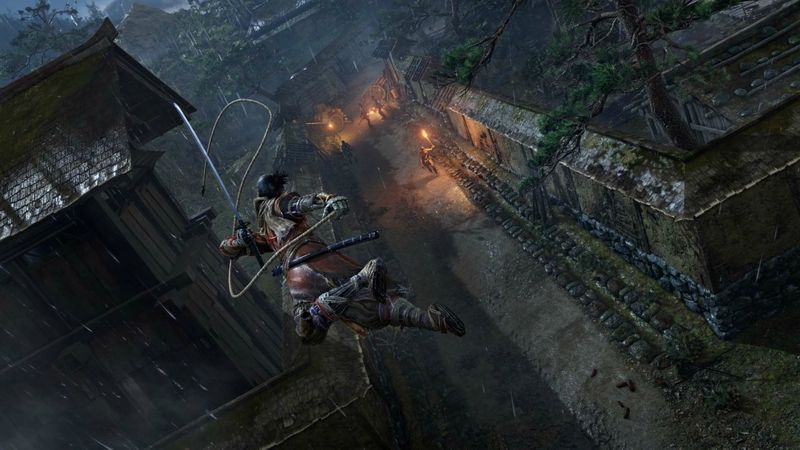 Sekiro was the same, despite its comparably different combat mechanics. In this Japan-set tale of kidnapping, revenge, honour and loyalty, you take the role of the Wolf, a Shinobi sworn to protect a young lord taken away by his evil uncle – who also lops off your arm in the process. There are elements here that feel wholly new, certainly, but make no mistake: this is a Soulsborne game in all but name and setting. From Software are very clever at taking their tried and tested mechanics and changing just enough each game that they subvert our expectations, re-instil the initial unease we grew accustomed to in their last game, and once more leave us feeling unsettled and under-prepared in the face of new challenges. 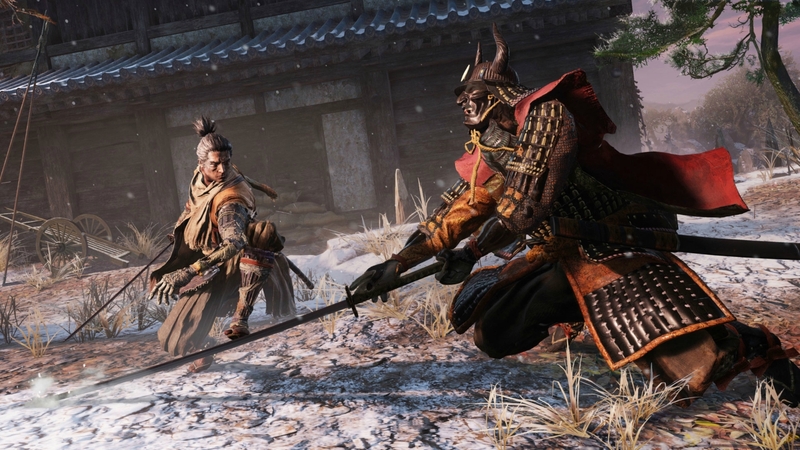 In Sekiro, the big change is the combat itself. 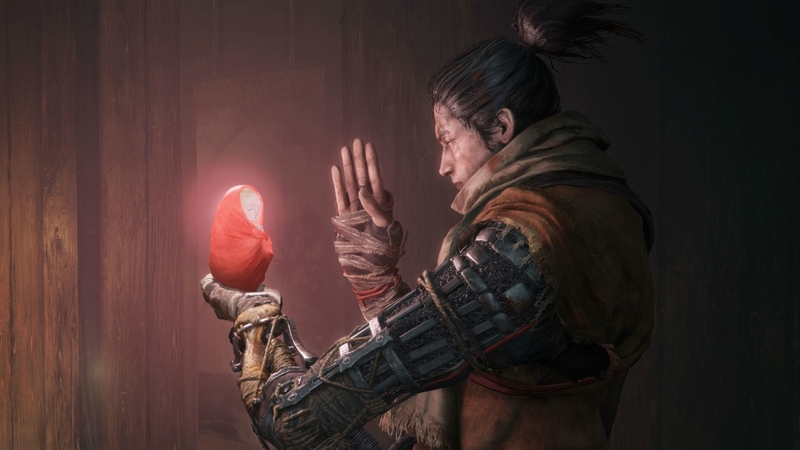 Where the Souls trilogy gives you a heap of options and playstyles to mould the game around your preferences, Sekiro feels more like an evolution of Bloodborne. Parrying, posture and positioning are everything. Armed primarily with a Katana, Wolf is every inch an accomplished Shinobi. Poised behind a sword is his comfort zone, and it must become your comfort zone too, by hell or high water, if you wish to succeed. This isn’t a game about finding your own rhythm or choosing a build and playstyle you feel comfortable with. For the first time From Software have taken much of the control away from you. There are secondary weapons and arts to learn, yes, but you’re very much tasked with learning how to fight as Wolf, rather than building Wolf to fight your way. Which, honestly, is a little double-edged. On the one hand, character progression feels more linear, more direct, arguably more meaningful. You are improving Wolf, and therefore there are no useless skills or stats to regret later. But on the other, this is not a game where you can really mix it up. Action is more prescribed, despite a decent stealth element, and so if you’re not fighting how Wolf would fight, you’re going to lose more often than not. There are skill trees with which to tweak Wolf’s secondary weapon and arts , which is new for From, but many of the changes and improvements are subtle and characteristically incremental. Many enemy movements and animations are lifted directly from previous From games. While there are an increasing number of beast-like enemies and demons, the bread and butter sword-fodder, particularly in the early game, are lesser samurai. Every enemy has a health bar, a Posture bar, and finally a deathblow indicator. The latter is depicted as a red orb, or several red orbs, and each time you break an enemy’s posture, either by parrying and counter-attacking or by dealing damage, the next attack you do will perform a death blow, removing one red orb. Removing the final orb will kill the enemy, usually in a satisfyingly bloody way. What this means is that if you cannot master the timing and nuances of combat, you will struggle. You cannot build the Wolf differently to tank an enemy or use a bow; you must learn to fight as a Shinobi, or play something else. This is perhaps the most radical departure From have made in Sekiro. We’re used to their games offering build diversity, but here that’s kept to a minimum. I might personally prefer previous offerings, but I understand the ethos behind it: Sekiro, you see, is a more personal story. You’re not a faceless Beast-Hunter or soulless undead; here you’re a broken man on a singular mission to restore your honour, and as such it makes more sense to limit build options to skills and gear as opposed to weapons and stats. In place of his lost arm, Wolf has a Shinobi Prosthetic which a mysterious sculptor can fit with various tools, including a shuriken launcher, a flame-thrower and a hidden switch-axe – you can even throw handfuls of ash into an enemy’s eyes to temporarily disorient them. Used in conjunction with the Katana and skills, this tool allows you to approach enemies in ways that differ subtly but significantly. More importantly, the Prosthetic allows Wolf to latch to grapple points to get around quickly, or reach vantage points to either assassinate or eavesdrop enemies. It’s also useful for escaping combat quickly, and can be put to good use on some of the mini-bosses whose open-air arenas offer escape vectors for when the going gets tough. The main bosses you’ll need to face head on and kill, but there are fewer here than usual, and the difficulty comes from the increasingly inhuman grunts you’ll meet in the open world. Stealth plays a major part, and a dedicated crouch button, jump button, wall-scramble, and the ability to hang from ledges and shimmy along narrow cliff faces feel like a very quiet nod to titles like Ninja Gaiden. Handily, most enemies, including mini-bosses, can be snuck around and attacked from stealth – which always removes a red orb and makes them that much easier to best. As with other From titles, the critical path is linear, but there are many branching byways and shortcuts to make getting around more intuitive, so if you’re faced with a tough enemy or group, it’s worth looking around for alternate routes or ways to get the drop on them. As always, there’s no need for a map, as navigation feels natural and, somehow, easy to remember. I really don’t know how From do the voodoo that they do-do, here, because in games by any other developer I’m lost without a map. The story is, at its heart, pretty basic stuff: a young boy is kidnapped and his crestfallen former bodyguard will stop at nothing to free him. Along the way the plot takes in more and more supernatural elements, while exploring the relationship between life and death, and whether dying with honour is better than living without. When you rest at Sculptor Idols (lanterns or bonfires, to the laymen) areas repopulate with enemies as you spend currency on replenishing gear and levelling up. 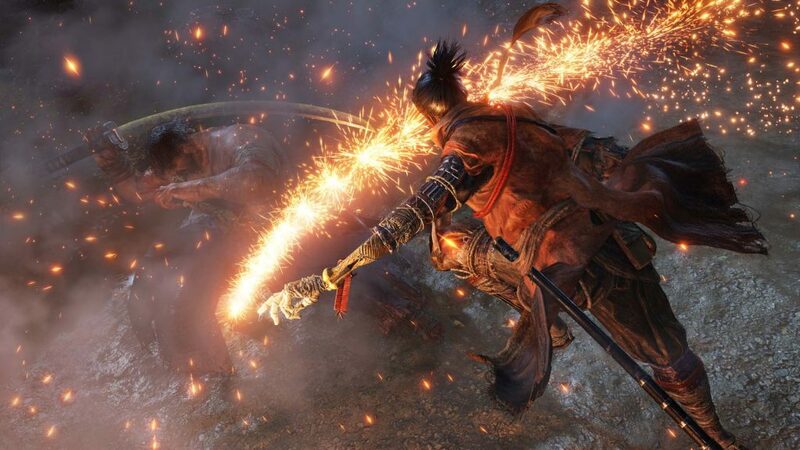 The progression is slow and measured in Sekiro though, as you cannot increase health or damage until you have four prayer beads to make a necklace, which can take quite a while to round up. Likewise, health gourds which replenish your health come from gourd seeds, awarded when you kill a tough enemy or boss. It’s a solo game this time around, with no option to summon in other players, which gives you a greater sense of accomplishment, sure, but also makes things tougher, leading to more deaths which rob half your XP (which you use to unlock and upgrade your Shinobi arts), steal your Sen (coin), and bring the enemies back to life. It’s not really explained why enemies can respawn; it’s now just something From games do, which may be fine with you, but it would have been nice to see some proper context. For much of the early game, people discuss the kidnapped boy as a kind of chosen one and, although From prefer to tell stories using the broadest of strokes and allow you to fill in the rest from item descriptions, dialogue bites and flavour text, there are more cutscenes here than we’re used to, which helps to tell a more intricate and powerful story. 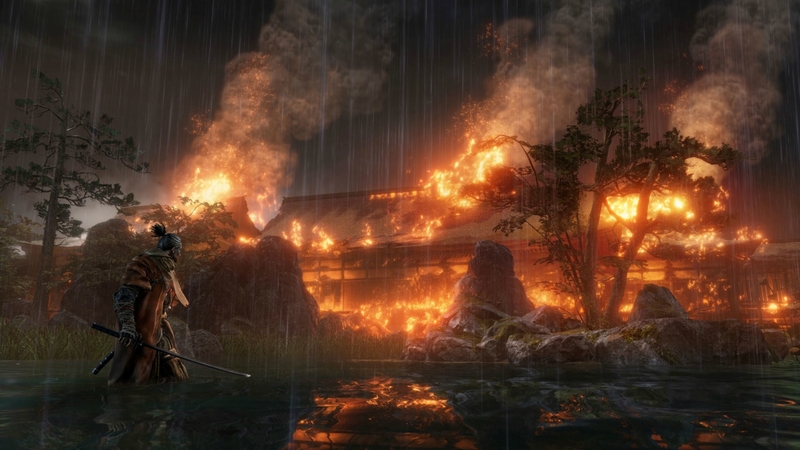 An air of ghostly serenity weaves its way through every moment of Sekiro that isn’t filled with brutal violence, creating a bizarrely unsettling atmosphere that’s equal parts beautiful and disturbing. But this is not Lordran or Yarnham, and the open vistas are sometimes breath-taking. It has to be said though, that the engine is beginning to show its age, as the motion blur and muted pallet can occasionally make it tricky to pick out enemies, and the camera feels far too loose and sensitive for me. Enemy design, too, feels less creative this time round until you start to face the non-human ones. Sekiro: Shadows Die Twice is a great game if you’re prepared to give yourself over to it even more completely than in previous From titles. You’re not bringing your own style and personality into the arena, and it’s much more an action-adventure than an action-RPG. It encourages and rewards exploration, and the punishing difficulty makes the stealth feel meaningful and often essential, but there are elements that I felt didn’t gel together as well as I’d hoped. The engine, while still able to produce wonderful environs and maintain a crucially steady framerate, is becoming creaky. Ultimately though, despite protestations of the opposite, this is very much a Souls game with a different flavour, and as such thrills with its challenge but never really surprises you. When you master the rhythm of dodge, parry and counter that Sekiro absolutely demands, the combat is elevated to truly lofty heights, but compared to previous titles it feels much more prescribed and much less customisable. That said, the introduction of new traversal ideas, proper stealth and a more focused narrative mark this out as different enough to warrant true merit, and prove that From Software still have a trick or two up their sleeves. The introduction of new traversal ideas, proper stealth and a more focused narrative mark this out as different enough to warrant true merit, and prove that From Software still have a trick or two up their sleeves.